Today is January 10th and I think I’m just about back to normal. If you know me, I am not very structured and all planned out, but I do appreciate being on a routine. Can you call me up and suggest an adventure or a caper or just a hot cup of coffee and sweet conversation? Absolutely! You know how it goes…we hosted our annual Thanksgiving HooHa, then rolled right into Christmas parties and visiting. Lucky for me, I also got the green light to move my craft room from the upstairs into the basement. Well that meant a whole lot of mess! Christmas decorations needed to be put away and the craft room hauled down two flights of stairs. While that whole process took place, the rest of the daily/weekly chores got put on the back burner, which meant toilets grew funky science experiments, one needed a ax and rope to climb the mountain of laundry and the tumbleweeds of fur threatened to sprout legs and take themselves to the garbage can. Yet through it all, my friends, today bathrooms were scrubbed, clothes washed and put away, and the vacuum did triple duty. I returned items to the store, picked up the new bible study, bought groceries (dinner will be served! ), filled the car up with gas and paid bills. The end. I do believe it is time for tea. 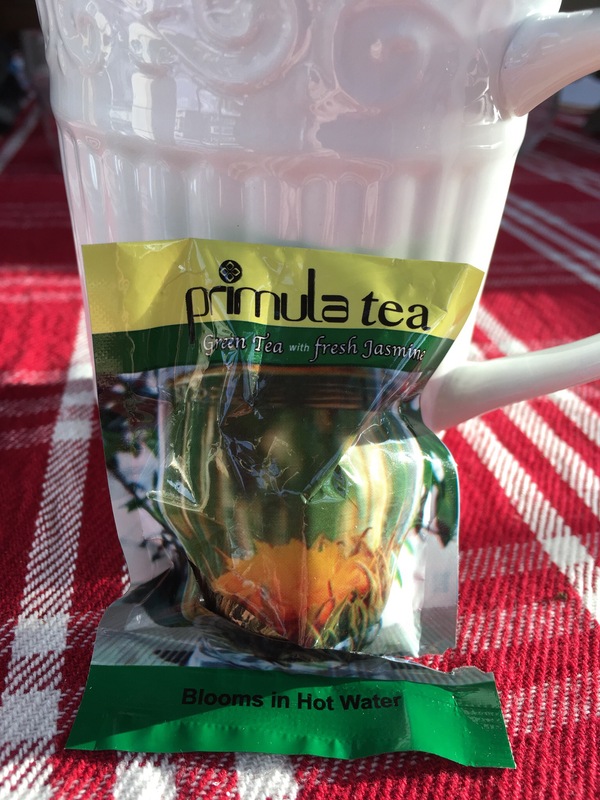 Have you tried this blooming tea? This little bound nugget of tea comes in the package. Drop it in hot water and watch it bloom! Wait for it…. Oops, the steam clouded up my camera. It’s so pretty, isn’t it? Im going to add a little bit of honey, find me a comfy chair and count my blessings for the day. I just feel so fancy! Hope you are finding your groove in this new year! Posted on January 10, 2017 by mary •	This entry was posted in Home and tagged blooming tea, relax. Bookmark the permalink.